Notes: According to Jim McClennan, in his book - "Flyfishing Western Trout Streams", a Mr. Peter Chenier developed this fly in the 1980s. 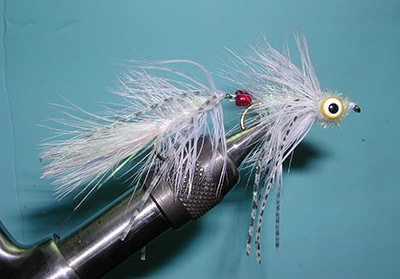 This fly melds the best of the wooly bugger and muddler together, to form the classic Bow River Bugger streamer pattern. Remember to not pack the muddler-style head as tight as a Tim England bassbug. A loosely packed head will aid the BRB in staying on the bottom. Tight packed heads are eye catchers, but loosely packed heads fish better. The white headed Bow River Bugger is commonly sold in Calgary fly shops. Jim McClennan notes that black, olive, and white are the best colors. The black/olive/natural deer hair combination has proven to be the best performer for me. The Bow River Bugger is heavily weighted and fishes best along the bottom of the river. I use three basic rigs to keep my BRB along the bottom of the rivers as I fish it. My most common rig is a floating line with a 9 to 10 foot leader in 1X or 2X. In fast water, I'll place some split shot 8 to 10 inches above the BRB. In deep water situations, I'll break out my Teeny 300 with a 4 foot leader. Do you like woolly buggers? How about muddlers? Peter Chenier loved both so much he couldn't decide which to use, so he created this streamer pattern to literally have both at the same time! 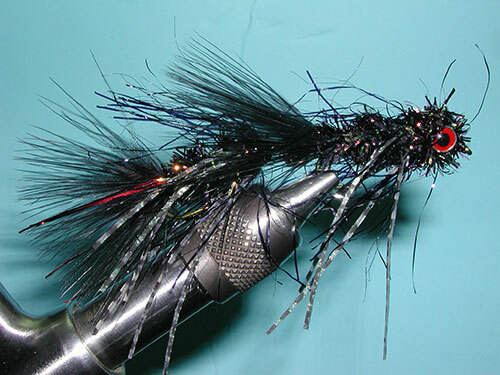 This fly boasts a marabou tail, chenille body, black saddle hackle, and a small dash of flashabou in the tail. The conehead not only makes it easier to cast, but it also helps make the fly look more realistic giving you even more advantage over the fish you're gunning for.